It takes a lot to forsake your home, clamber on to a crammed, rickety boat, and venture out into the uncertainty and danger of the high seas. But this is precisely what tens of thousands of people from Burma's Rohingya ethnic minority have done in recent years, leaving before the monsoon season settles in and their fates become even darker. Some drown in the Andaman Sea; others, abandoned by the human traffickers they are forced to trust, drift without water and food aboard what activists describe as "floating coffins." And unlike many migrants rescued by European governments in the Mediterranean, the Rohingya can't even trust in the goodwill of Southeast Asia's governments. In the past week, thousands of Rohingya have become subjects of an unseemly game of regional "ping-pong," their boats pushed back by governments not keen on accommodating any more asylum seekers. On Friday, in a notable exception, one vessel with 800 passengers was allowed to make landfall in Indonesia. "If I had known the boat journey would be so horrendous," said a 19-year-old Rohingya refugee, who had lost her brother at sea, "I would rather have just died in Burma." The spur of the crisis is in the remote, western part of that country, also known as Myanmar, where the majority of the roughly 1.3 million Rohingya live. As WorldViews has discussed before, even though the Rohingya can trace their origins in what's now Burma over many centuries, the Muslim minority is refused citizenship status by the Burmese state, which classifies them as "Bengali" interlopers from across the border. In 2009, during an earlier Rohingya boat people crisis, a leading Burmese diplomat scolded foreign journalists for feeling sympathy for the would-be refugees, saying they "are as ugly as ogres." Mob violence and ethnic pogroms, which flared in 2012, led to tens of thousands of Rohingya fleeing to squalid displacement camps. Denied adequate recourse to state services in both Burma and Bangladesh, many Rohingya endure malnutrition, abuse at the hands of local authorities, and restrictions on everything from movement to access to education to their ability to get married. The United Nations recently described them as one of the world's "most persecuted minorities." A report this month from the U.S. Holocaust Memorial Museum warned that rising Buddhist nationalism and anti-Muslim sentiment in Burma made the Rohingya a "population at grave risk for additional mass atrocities and even genocide." It is estimated that a tenth of the community's population has attempted to leave their homeland in the past few years. If you want to get a sense of how profound the denial of rights for Rohingya is, consider this: Burmese officials have already indicated that they won't attend a meeting on the refugee crisis, to be hosted by Thailand later this month, as long as the name "Rohingya" is even invoked at the session — something that would indicate de facto recognition of the minority. Even Nobel laureate Aung San Suu Kyi, a leader of the Burmese opposition and a celebrated figure of global conscience, has remained shamefully silent on the plight of the Rohingya. Other regional governments, including Thailand and Malaysia, have said the burden of housing the Rohingya is not theirs to shoulder alone. "We cannot welcome them here," Malaysian Deputy Home Minister Wan Junaidi Jaafartold CNN when asked about his country's policy of turning the illegal migrant boats away. "If we continue to welcome them, then hundreds of thousands will come from [Burma] and Bangladesh." Part of the problem is the presence of economic migrants from Bangladeshamong the Rohingya asylum seekers. They travel along well-established trafficking networks that convey would-be migrants through Thailand's jungles into Malaysia, a Muslim-majority country that until recently was a favored destination for Bangadeshi migrants and Rohingya refugees. 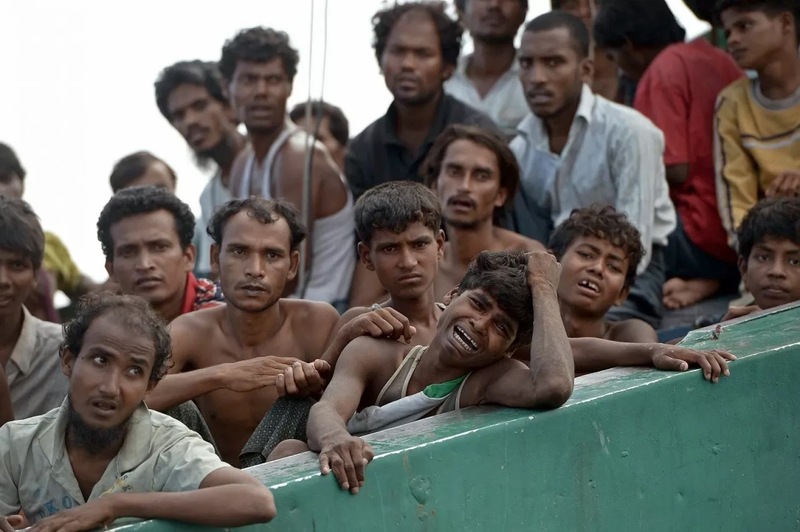 It is believed that a recent Thai crackdown on the land routes, where countless duped Rohingya and Bangladeshis are thought to be held in slave-like conditions by traffickers, led to the influx of Rohinyga on the seas. The crisis ideally ought to be resolved by ASEAN, Southeast Asia's leading geopolitical bloc. But it is a notoriously toothless institution. Unlike the European Union, ASEAN shies away from taking moral stands on issues of human rights and democracy. Current signs, and the absence of popular sympathy for the Rohingya, seem to suggest that not much will change. The plight of the Rohingya, as Hong-Kong based journalist Heather Timmons observes, also ought to win the attention of Asia's two most important leaders — Chinese President Xi Jinping and Indian Prime Minister Narendra Modi, who met last week. But the duo's lofty rhetoric of shared dreams and regional progress notwithstanding, their countries are deeply invested in Burma, including in projects that have an adverse effect on the Rohingya in Rakhine state. For a stateless people, the world is a most uncharitable place.